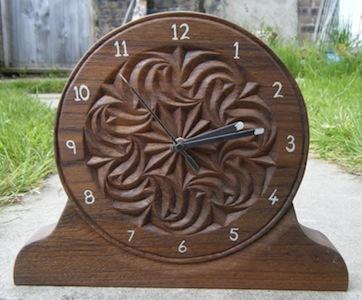 My clocks are all handmade using the technique of chip carving. I have a number of different designs for the clock faces and I am willing to adapt your ideas for a personal design. My clocks can be made to many different sizes and they can be made for mounting on a wall or to stand on the mantel. Prices vary from £40 upwards + postage. Please contact me for more information.